Women should look amazing every day! YES !!! Even when they are wearing casual summer outfits with jeans. I know ! Some of you have to respect a dress code at the office. But during summer holidays or worm week-ends, you can always try summer outfits with jeans. Personally, I like wearing denim clothes, even when it’s hot outside. And I am sure I am not the only one. It feels comfortable and easy to match. 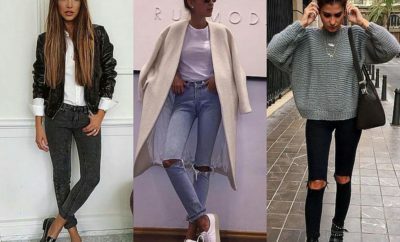 So, if you are trying to find new ideas about how to wear casual outfits with jeans, take a look at these pictures. You’ll have the possibility to choose between summer work outfits with heels or summer outfits with jeans. Dress well and you’ll be smiling all the time. Why? Because you’ll feel confident. We could say the world will be better. Try to make some changes in your wardrobe. Find inspiration when looking at these cute outfits with jeans for summer. Hope you’ll find new ideas about how you should match different types of jeans with other pieces of clothes and footwear. Most of the time, people are buying casual clothing, even when they think to create casual classy outfits. The important thing is not to buy many clothes, but to choose some essentials pieces for your wardrobe. Using those pieces of clothes, you can create casual wear for women according with the fashion trends of the year. And most of the time, wearing casual outfits with jeans is very trendy, even during summer. That’s why, before you go shopping, you should look at these cute summer outfits with jeans. Test drive these super-simple examples of summer outfit with jeans. Sport your favorite pair of skinny, flared or boyfriend jeans in a combination with over sized T-shirts or flirty blouses. You have a hard time giving up high-heels? No problem! 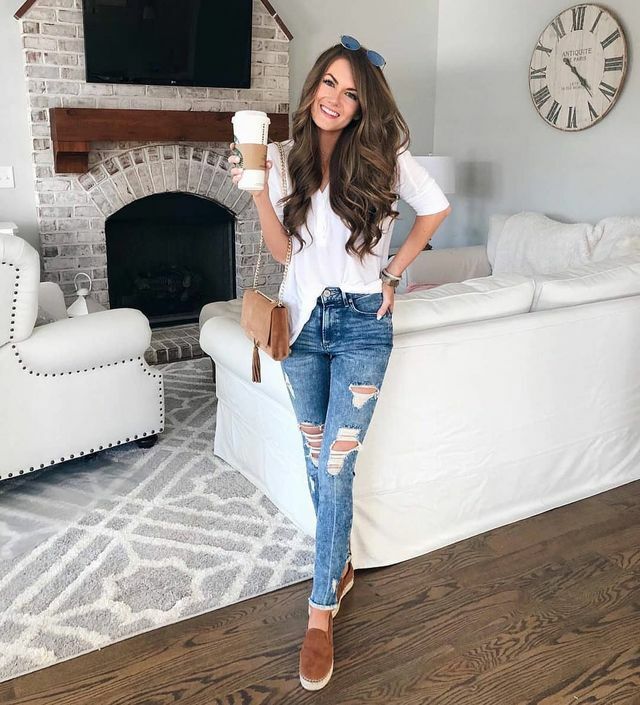 These pictures with cute outfits with jeans for summer provide us many tips on how to complete our daytime sets with a pair of sandals or stilettos. But extravagant sneakers are also ‘in‘ and can be the perfect accessories to pare down your look. 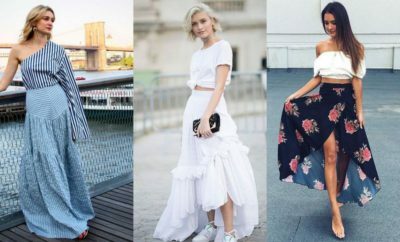 Try these summer going out outfits when you go out with your friends. 1.Wearing white jeans is very suitable for the hot season. Match these jeans with an elegant and beautiful blouse like the one from the picture bellow and you’ll have a nice trendy and chic outfit. 2. Try this simple outfit with cropped jeans and a simple flowy blouse like this one. These white high heels sandals are perfect for this elegant and in the same time casual outfit. 3. If you are a skinny girl with a perfect abdomen, don’t be afraid to wear a short blouse. 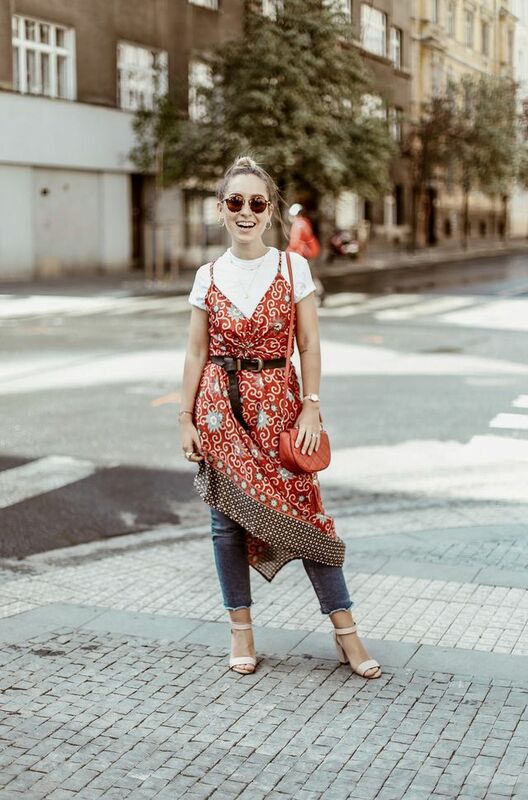 Look at this extraordinary outfit… the idea of choosing the same color for the sandals and jeans and another color for the crop top, it seems to me perfect for this casual summer outfit with jeans. 4. If you have beautiful shoulders, don’t hesitate to create a summer outfit with jeans and this beautiful white blouse. 5. 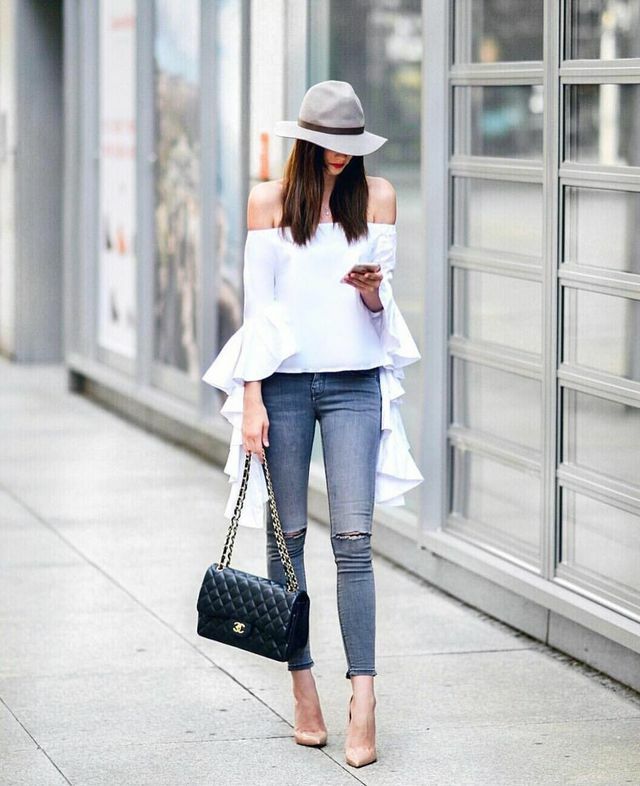 High heels, elegant white blouse with many ruffles, skinny jeans and high heels. Try this outfit every time you go out during a hot evening. Find in my trend report, more cute outfits with skinny jeans. 6. 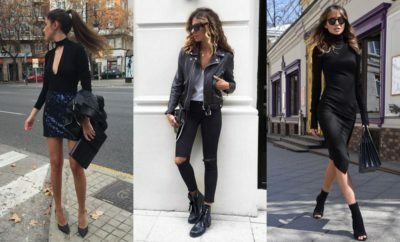 You should try outfits with heels and jeans if you like night outs. Remember! You could use this picture as inspiration, if you are looking for festival outfit ideas or winter date outfits. 7. White jeans, high heels and a large blouse. A perfect casual summer outfit with jeans. You can wear it from morning until evening. This versatile item can be used to create club outfits for summer or going out outfits winter. Your imagination is the limit. 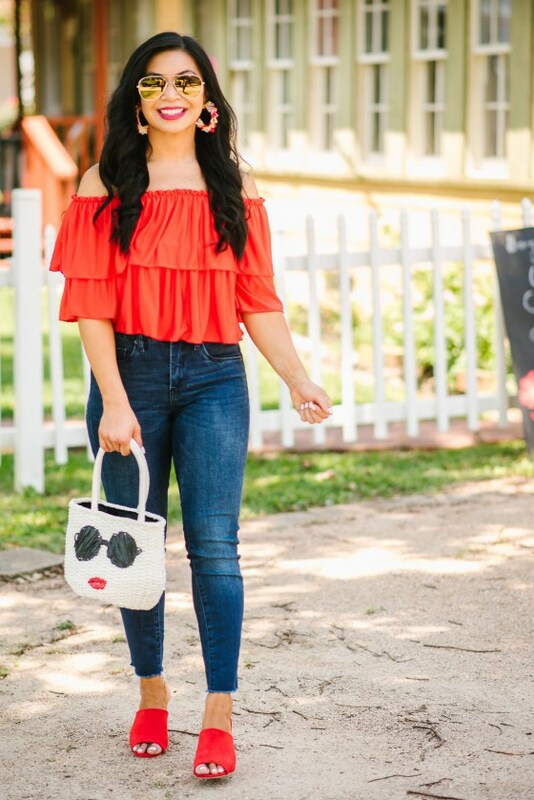 Looking for summer outfits with jeans? Well, the possibilities are endless. It depends on your tastes, your choices, your style and of course, it depends on what type of clothes you are shopping. I tried to find on the internet, bloggers from around the world, presenting how we should dress casual with jeans during summer. Hope you like the pictures as much as I do. 8. Try this super casual outfit with a kimono, this pink blouse with straps, wedge sandals and high waist jeans. It’s perfect for a summer evening. 9. If you don’t have any idea about how to create interesting casual summer outfits with jeans, try to match the color of your shoes with the color of your top. You’ll make a good impression. But what do you think about replacing the jeans with a red or a black leather skirt? You’ll have a beautiful a leather skirt outfit. Do you think it would be to much a red outfit from head to toe? 10. Simple and perfect is this outfit. High heels sandals to look thinner and taller, jeans and a nice and simple black blouse. As you can see in this picture, there is a match between the color of the blouse and the black sandals. 11. Happy, beautiful and casual. This is a fine and beautiful casual summer outfit with jeans. Wear it during the day. It’s perfect when you go out for shopping, a coffee or a walk in the park. For a stylish and feminine look, like, for example, a white pencil skirt outfit, you can replace the white jeans with a white skirt. 12. You are not exactly the kind of girl who likes to respect the rules… You rather like to express your unconventional style and you do it the best you can by wearing a long kimono with a pair of jeans. Take a look at this picture and find inspiration for such an outfit. 13. Once again: pair your skinny jeans with a blouse and sandals in the same color and you’ll have the perfect casual outfit for the day, like this one from the picture. 14. Embrace the Boho style. Try this outfit with a pair of high waisted jeans and a blue shirt and this strappy sandals. I just love this beautiful outfit. It’s sooo chic !!! Don’t you think? 15. Going out for a date and you want to wear something casual in a hot summer day? Don’t hesitate to try this outfit. It’s beautiful simple and I am sure you’ll impress your partner. Or, if you are looking for what to wear with jeans on a night out, this one could be a choice. 16. The weather is hot and you prefer something casual without heels? A large white blouse with long sleeves to protect your skin, skinny jeans and slippers are perfect for such weather. 17. Instead of skinny jeans and a long sleeve blouse, you could always try a t-shirt with large pair of jeans. You should consider this picture in order to create casual summer outfits for teenage girl. Use a hat and sunglasses to protect yourself during the hot days of summer. 18. Double jeans: denim shirt and white skinny jeans paired with white sneakers. Seem to be a interesting and a fine casual summer outfit with jeans. 19. Another way to combine a white blouse with skinny jeans and flat jeans. Love all these causal summer outfits with jeans. It’s hard to choose only one outfit… But who said we have to choose? 20. Like the idea of wearing casual summer outfits with jeans and shirts? This picture could be a good inspiration for you. Try red sandals for a good contrast between red and blue. This set is enough decent so you can include in it in a women’s summer work outfits . 21. Ripped jeans, white t-shirt and espadrilles… The perfect outfit to go out for a drink or a coffee. 22. Looking for a summer night out outfit? Do you want to be something casual but in the same time special? Well, high heels, high waist jeans and off shoulder blouse . Try it next time! But if you wonder what to wear with black pencil skirt, you could use this image for inspiration and replace the blue jeans with a black skirt. 23. Proud of your perfect body? Don’t try to hide it! Wear a short t shirt like this, a pair of jeans and shinny shoes. What do you think? 24. You should be confident to wear a blouse like this. But who says you are not? Take a look at this picture and copy it if you want to impress. 25. Such a splendid, impressive and a beautiful summer outfit… I could wear it every day!!! Would you? You could replace the jeans with different types of shorts and there you go for club outfits with shorts or a jean shorts outfits. 26. If you are looking for something simpler but still impressive, this might be the perfect outfit. If you were wondering what to wear on a first date for drinks, this outfit might be the answer that you were looking for. 27. Instead of wearing cute outfits with long skirts, you should copy this one from the next picture. From my point of view this might be the perfect casual summer outfit with jeans. Flat shoes, white jeans and a small, tinny black blouse. What more I could want? 28. Today you feel like you should try a casual summer outfit with black jeans and a beautiful elegant white shirt? Well, this might be the perfect outfit for you. If you exclude the high heels and replace them with flat shoes, you can create outfits for women over 50 . What do you think? Is it too much for an age like 50? 29. Wow, wow, wow!!! It’s my reaction to this beautiful outfit. I wish I had a body like her’s 🙂 . The idea of passing from a dark color on top to a lighter one to the toe, I find it brilliant. Usually I am avoiding to combine so many colors. But this time is interesting. You could replace the sandals with black shoes and pair the T-shirt with a coat and you’ll have the perfect fall outfit for women. 30. The perfect casual summer outfit with jeans for a day during your holiday. The flat roman sandals are what you need when you are visiting. I know! Jeans are the most popular pants. Even it’s hot outside, you can use them in order to create jean summer outfits. Share with me your top casual summer outfits with jeans. Do you prefer the casual style or the classy one? Let me know what summer casual outfit with jeans do you prefer. I would love to hear your opinion.